Gorgeous. You just can't go wrong with black and white (or stripes)! The pillow is perfect too. Great find, and makeover Pam. This is gorgeous. I prefer the bolster so you still see the beauty of the bench. Great upholstery job, Pam! I like the watercolor pillow - perfect for spring! Love, love, love the black and white stripes, the perfect fabric for that piece!. I would not be able to decide on the pillow either, they all look great. It's good to have choices girl! The gold frame just pops with that beautiful fabric...great choice and idea from "mom of six"....Just a perfect piece in your home! It looks perfect! Love the extra trim detail. Love it!!! Especially the black bolster! Your settee looks even more regal now! Great job and your pillow of choice is greatness. BEAUTIFUL Pam!! I love that fabric! It looks amazing Pam! And I love it the most with the beautiful watercolor pillow! Where did you get the black and white fabric? I've been eyeing a similar fabric in Nate Berkus' new line for my office drapes - wondering if the one you found is less expensive! Looks absolutely awesome! Love the stripe seat cushion. Accent pillow....??? Does it need one? The piece is so stunning just as it is. gooooooorgeous! i love the fabric- and well the piece itself is stunning, but you just took it up a million notches! I love how your bench turned out. The stripes are perfect and the watercolor pillow is ideal for spring. So cute, Pam! I like the pop of color pillow. Oh, it's lovely! It took me a minute to realize you were talking about my comment! Wow, thank you so much! It really looks great! AMAZING Pam! I know I always say this, but I think this is my favorite piece that you have ever made over!! I love the gold with the black and white, and the watercolor pillow, it is all right up my alley!! Gorgeous! I am so impressed at your turn-around time! It takes me forever to finish 1 DIY! The bench looks amazing - love your fabric choice. And I really like the 1st pillow. But not sure you need one at all. 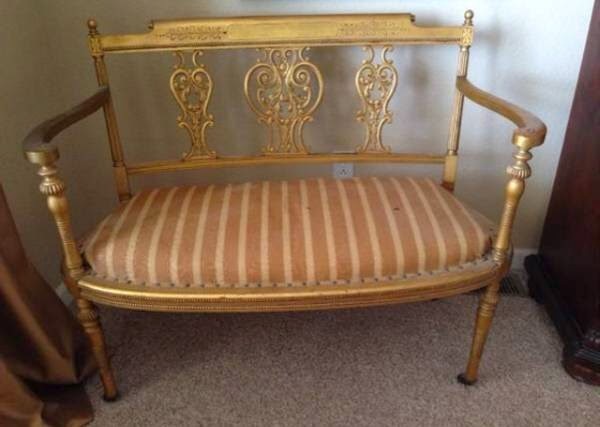 I love your blog and I love this settee! I think it may be my favorite piece so far that I've seen on your blog since I've been reading each morning. The upholstery is amazing and I like the first two pillows! I cant believe the great things you find on Craigs list...love the fabric! That looked pretty easy to do! This is a gorgeous make-over! I love the black and white stripe fabric, and the stitching detail takes it up a notch! Personally, I am loving the fabric panel you made into a pillow best! Such an interesting pattern! Would love to know where you found your fabrics! Excuse me...I need to wipe the drool off of my keyboard. :) I LOVE IT!! And what a perfect re-upholstery project-not too hard! PLEASE tell me you're keeping this one forever, b/c if you ever decide to sell it I'm driving to Denver to get it! OMG - I'm completely sick with envy - how out of this world GORGEOUS is this piece? It'll forever be tatooed on the back of my eyelids forever and a day now! Beautiful beautiful job Pam ! love the wide stripe!! the cording with nailhead is gorgeous too! Absolutely love it Pam! It turned out so fabulous and the fabric is awesome! High five! You need a Airstrike stapler girl!! Life changing! Love love lot it! It looks like a million bucks! It came out so beautifully. Love those wide stripes! I like it on its own without a pillow. Perhaps, add a tassel at each of the front legs. It looks wonderful!!! And I love the fabric on the seat! As for the pillows, I like the last one the best. :) And your staple gun looks impressive. I need a new one, where did you get yours? Another gorgeous masterpiece Pam! Love the piping !!!! My most fave pillow is the first!!!! Upholstery tacks! That is the answer I've been looking for because my dining room chairs are currently without fabric because my stapler won't reach far enough into the back of the chairs and I really didn't want to spend the money on an upholsterer for such a simple project. Thank you lady! I love the fabric you chose and I'm kinda digging that leopard/floral pillow! What a great find! I love it. You did a beautiful job reupholstering. All the pillows really cute....the bolster might actually be my favorite. Wow, what a gorgeous transformation. No surprise. I love it with the watercolor pillow. Your' pictures are really good too. I'm going to have to find something that I can attempt this on. Kris and Jennifer - I found the fabric at Colorado Fabrics here in town, I'm sorry I don't know the name of it, they don't disclose that. Sometimes I can tell on the selvage, but not this one. Pam, it turned out beautifully. Love the fabric you chose and the number of tacks you used look fine, you can always add more later if you decide they are needed. The gorgeous gold shows up so much better with your fabric. I love the floral watercolor best for spring/summer but whatever you choose will be perfect. You have amazing taste and I look so forward to your blog - you're one of the best !!!! Love the fabric and the trim. Another job well done! I prefer no pillow because the piece and fabric are so great but I am boring and practical like that. It really looks great, Pam and the placement in front of the mirror is inspired. Expert job! It looks amazing. I love both pillows--how can you go wrong when the bench is so wonderful. The nailhead trim is stunning and you did a great job! Adore the bench; what a great find. I prefer the bolster pillow with it but you're right, the square pillow looks like a burst of spring. Visiting from Wow us Wednesday- your bench looks fabulous! I was thinking in the first photo how a round bolster would look great centered and then in the next picture there was one! I like the bolster's fabric because it lets your eye look at the bench and pillow as a whole. The other pillow is pretty but it pulls your eye to it. Just a thought! I like the fabric you chose- modern mixed with antique is a fabulous look. The bench is to die for! I love the fabric combined with the ornate gold frame. Beautifully done! I like the pillow with the cheetah print. Exotic!! Pam- I love your upholstered bench you did! Great job! Those stripes with the Spring pillow is gorgeous. It looks gorgeous! I love the fabric and the watercolor pillow. In a word- stunning! Count me in as another fan of mixing antiques with modern. It really does create a great look and in this case a great focal point. Very impressed! Awesome bench! I love the mix of the modern fabric with the old looking woodwork. It is sheer perfection! Visiting from Wow Us Wednesdays, congrats on the feature! What an awesome find! I would have snatched this one up too! so i already drooled over this once, but my partner has a settee to cover and this fabric would be amazing- what is the source? i can't find it in the post. thanks! Love it Pam! 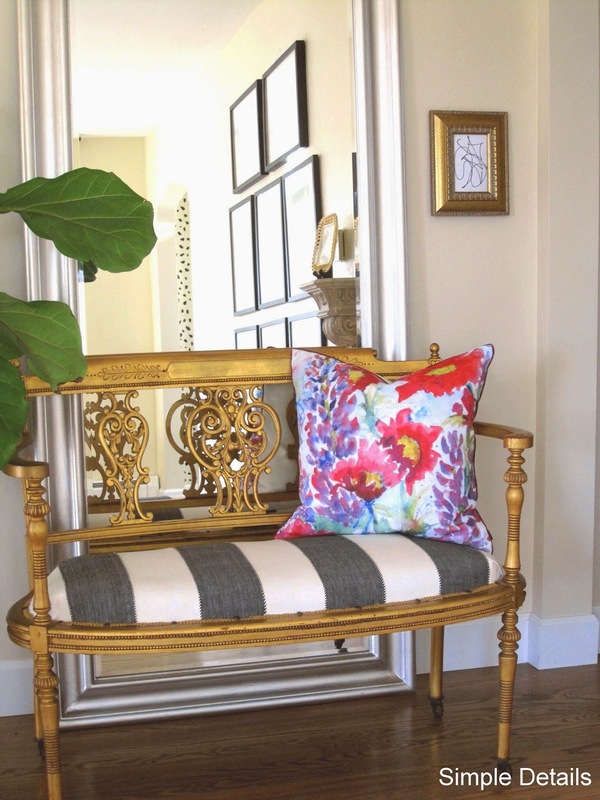 And the bright watercolor pillow with the black and white stripe is what caught my eye! Beautiful!